Artist Su Blackwell will return to Yorkshire next week to talk about her current exhibition, Remnants, at the Parsonage on Thursday 21 October at 7.30pm at the West Lane Baptist Centre, Haworth. Sheffield-born Su Blackwell studied for her first degree at Bradford College of Art and Design before going on to complete her MA at the Royal College of Art in London in 2003. The Brontë Parsonage Museum commissioned Su Blackwell to create an exhibition of new work for the museum, inspired by the Brontë collections. The London-based artist creates intricate miniature artworks using antique books and paper. Her exhibition takes inspiration from the stories surrounding the Brontë family and features a series of site specific installations in the period rooms of the house. For the Children’s Nursery, Su has created an installation inspired by the Brontë children’s imaginary kingdoms. Miniature churches, castles and a mill on a river – complete with turning waterwheel – form the back-drop for a battle between the Brontë children’s toy soldiers. Elsewhere, linen-cut moths fly from a Brontë nightshirt on the bed. A Victorian dress hangs in a window, laser-cut with heather patterns to represent Emily Brontë’s favourite flower. In the Dining Room, the pages of a book turn as if by an invisible hand. Su will talk about her unique paper-cutting techniques and way of working, as well as her inspiration for the Remnants exhibition, with Grant Gibson, editor of Crafts magazine. Tickets cost £5 and can be booked from Arts Officer Jenna Holmes: jenna.holmes@bronte.org.uk / 01535 640188. The talk features as part of a series of activities and workshops taking place at the museum during the exhibition. On Saturday 23 October, visitors to the museum will be able to try paper and book-inspired creative activities led by artist and bookbinder Sarah Brown. This is a drop-in event that is free with admission to the museum. On Wednesday 27 October, a half-term holiday workshop for children aged 6-12 will take place with local artist Rachel Lee, making paper-art inspired by the Remnants exhibition. Places cost £5 per child and can be booked from susan.newby@bronte.org.uk / 01535 640185. Remnants runs until Sunday 28 November 2010 and is free on admission. It has been funded by The Radcliffe Trust and Arts Council England as part of the Parsonage’s contemporary arts programme. The speaker at this year’s Literary Luncheon, held, appropriately enough, in the Brontë Suite of the Crown Hotel, Harrogate on Saturday, was the biographer and critic Jenny Uglow, who is currently the editorial director of Chatto and Windus. She is much in demand in the world of television when it comes to adaptations of the works of Elizabeth Gaskell for the simple reason that she is one of the world’s leading authorities on the novelist – and of course biographer of Charlotte Brontë. She was eloquently introduced by Patsy Stoneman, who emphasised her deep admiration and listed some of her works, like for example The Lunar Men (which won the James Tait Memorial Prize in 2002), A Life of Thomas Bewick and Elizabeth Gaskell: A Habit of Stories. All round the horizon there is this same line of sinuous wave-like hills; the scoops into which they fall only revealing other hills beyond, of similar colour and shape, crowned with wild, bleak moors--grand, from the ideas of solitude and loneliness which they suggest, or oppressive from the feeling which they give of being pent-up by some monotonous and illimitable barrier, according to the mood of mind in which the spectator may be. Gaskell “sees herself as a kind of anthropologist”, depicting the people of Yorkshire (largely for the benefit of her readers in the southern counties) as a “cut-off race” descended from Scandinavians, people with a peculiar force of character. She had a strong idea of what the countryside should be, living herself in Knutsford in Cheshire, just a few miles from industrialised Manchester. She saw Knutsford as a place for solitude, grassy and romantic, a place to escape the grim poverty of the big city. Wild countryside, for Gaskell, “releases something elemental in you”. It “got into the Brontës’ blood”. Gaskell’s experiences of wild countryside included Snowdonia as well as the moors around Haworth. She was concerned with the way that dangerous passions were addressed in Charlotte’s work, anxious to defend her from the charge of coarseness. The first description of Charlotte Brontë in the biography does not come until Chapter Six, when her plain features and tiny hands are mentioned in such a way “that she sounds like a small animal, a bit of a wild thing”. Gaskell tells us that she “seldom went down into the village, preferring the solitude of the moors” which is not entirely true, though it does apply to Emily. Jane Eyre can be read as myth because “the characters in it are all from this Yorkshire race”. The harsh landscapes have brought out a capacity for self-sacrifice, a fact which interests Gaskell because it links with Christian myth. For her, a harsh rural life could be equivalent to a harsh industrial life in order to serve this. Charlotte is depicted as living in solitude with the sky as a companion. Gaskell saw Charlotte Brontë as a woman of solitude, who has suffered and survived in this landscape. 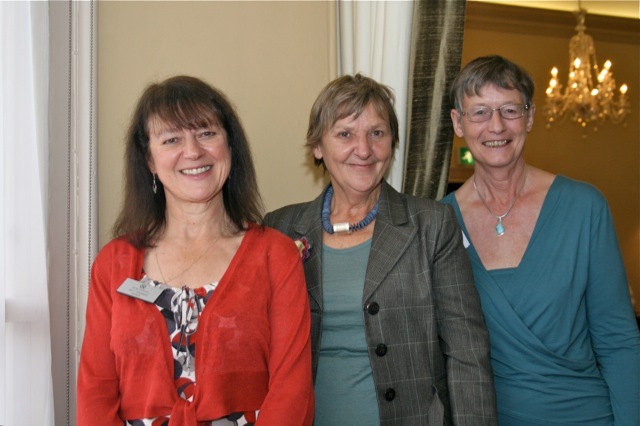 Below – Sally McDonald (Chair of Brontë Society Council), Jenny Uglow and Patsy Stoneman. 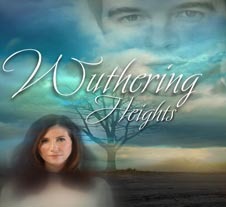 Jane Thornton's intelligently-pruned and effective dramatic version of Wuthering Heights opens tomorrow (8pm) in Ferensway at Hull Truck Theatre, directed by John Godber. Make plans to see it if you can, because it is likely to capture the essence - it's there until the twenty-third of the month. "This simple production far outclasses more lavish attempts" said the Yorkshire Post reviewer - presumably referring to the last time it was showing in Hull. Thornton's rendering seems to have caught on with other companies in the last few years - I remember the production by the Two Hats Company (directed by Blanche McIntyre) which toured in 2007. The deterioration in the condition of Anne Brontë’s headstone, that many commented on in 2009, worsened through the long hard winter of 2009-10. Concerned about the deterioration, only seven years after conservation work had been carried out on the headstone, the Brontë Society commissioned a second professional conservator to undertake a condition survey at the end of 2009. That report agreed with the 2002 report that once the laminated surface of the stone has been penetrated, as has occurred on Anne’s stone, further erosion is inevitable and so long as the stone remains in its exposed salt-laden environment, even constant treatment will only slow the rate of physical loss. This summer, the Brontë Society received a third professional opinion, this one from a senior church buildings officer with the Diocese of York, that confirmed that restoration in situ would be no more effective than was Canute against the tide. Throughout this summer, the Brontë Society has been engaged in broad consultation with parties concerned about the future of Anne’s headstone. These have included many of its own members, bloggers to the Brontë Parsonage Blog, local and tourist visitors to the grave, the Vicar of Scarborough, the St Mary’s Parochial Church Council and Diocesan officers. Options presented included leaving the original headstone to decay where it stands, its replacement by a replica, and the removal of Anne’s body to Haworth. The consensus that emerged from the consultations was so overwhelming that the Council of the Brontë Society voted unanimously at its meeting on 18 September to leave the original headstone to decay where it stands but to commission the cutting of an interpretive plaque to be installed at the headstone’s base. The exact wording of the original stone would be engraved on the plaque together with some brief historical interpretation. The plaque would be of slate, slate being native, durable and as hospitable as is sandstone to the local flora such as lichens. The Scarborough St Mary’s Parochial Church Council supports the installation of such a plaque and the necessary permission will be sough from the Diocese of York Consistory Court. If the Court consents, it is hoped that the slate plaque can be engraved and installed during 2011.